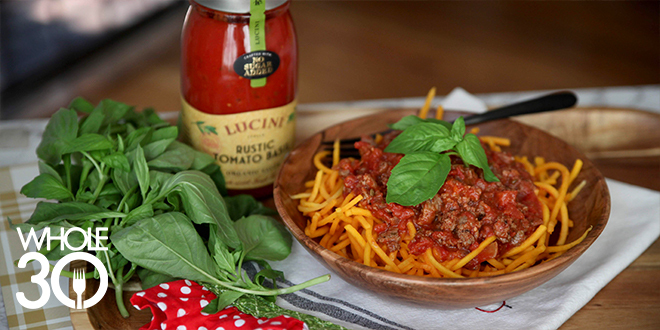 Today, we’ve got something delicious for you from our newest partner, Lucini Italia®, makers of delicious Whole30 Approved® tomato sauce. When we heard the Lucini Italia company philosophy—that great tasting food comes from only the most cared-for, highest-quality ingredients—we knew we had a match made in Whole30 Approved heaven. 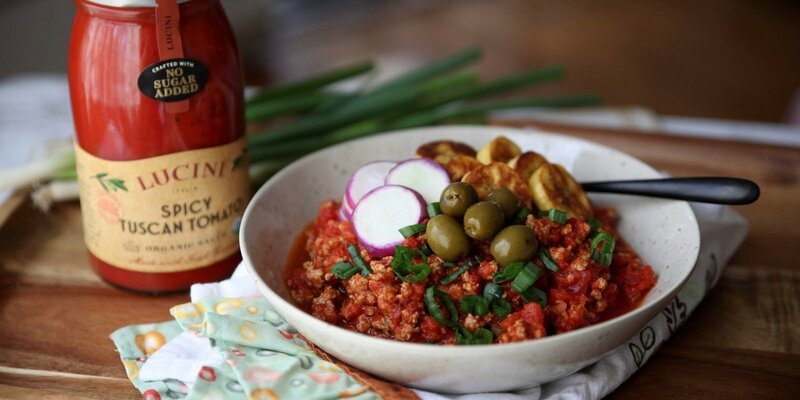 Lucini works with small regional farmers, celebrated chefs, and health and wellness experts to create delicious, authentic, handcrafted, Whole30 Approved tomato sauces and olive oil, inspired by the culinary traditions of Italy. Their lineup of sauces includes Rustic Tomato Basil, Tuscan Marinara, Spicy Tuscan Tomato, and Roasted Garlic Marinara. 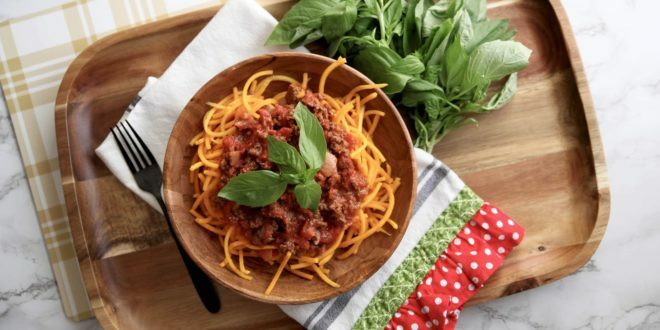 All four are 100% organic and contain no added sugar—the perfect upgrade for your bowl of zoodles and meatballs. And, their Extra Virgin Olive Oil is the very first olive oil to receive the Whole30 Approved label, a title we don’t take lightly. They’ve been working exclusively with the same small family-run regional farmers in Italy for over a decade, and this small scale operation and respect to tradition allows them to achieve an unmatched flavor. We love it for roasting veggies, tossing with fresh greens, or garnishing a bowl of soup. When we first got our hands on these new sauces and olive oil, we couldn’t wait to get them on the table. 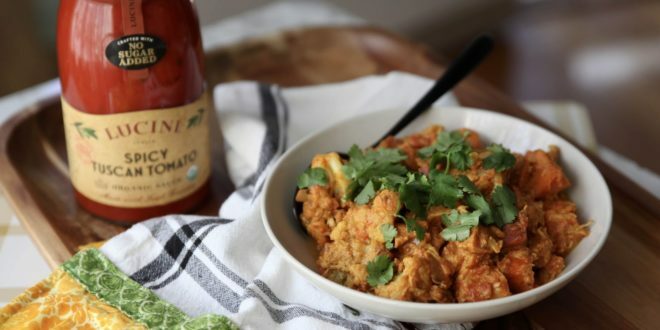 Whole30 recipe creative Sarah Steffens whipped up three easy weeknight dinners, plus an easy “green sauce” for dipping or topping, thanks to the flavor and convenience of the Lucini Whole30 Approved lineup. ADD olive oil, diced onion, chopped cauliflower, chopped sweet potato, sea salt, black pepper, and minced garlic to a large skillet and heat to medium-low. ADD chopped chicken breast (or canned chicken meat) to the skillet. ADD coconut cream, curry powder, and tomato sauce to the skillet, stirring with the veggies, and reduce heat to a low simmer. SIMMER until the chicken is cooked through, about 10-12 minutes. GARNISH with optional fresh cilantro and enjoy! Serves four. ADD olive oil, diced onion, sea salt, black pepper and minced garlic to a large skillet and heat to medium-low. STIR often as onions soften, about 3 minutes. ADD ground beef, breaking up with a wooden spoon and cook until done, about 10 minutes. Drain excess grease. STEAM butternut noodles until soft, about 8-10 minutes, while the ground beef is cooking. ADD the entire jar of tomato sauce, stirring together, when the beef is cooked through, and serve over butternut noodles. GARNISH with optional fresh basil leaves and enjoy! Serves four. ADD ground turkey, breaking up with a wooden spoon and cook until done, about 10 minutes. Drain excess grease. ADD plantain slices and sea salt and allow plantains to sear until crispy, about 2 minutes per side. Set aside. ADD the entire jar of tomato sauce, stirring together, when the turkey is cooked through. GARNISH with plantains, radish and green olives with optional minced scallion and enjoy! Serves four. PLACE fresh herbs, sea salt, red wine vinegar and garlic in a food processor and pulse for about 20 seconds. ADD nuts and olive oil and pulse until well combined, about 20 seconds. SERVE with meats and veggies, in a scramble or with crudites and enjoy! Makes 1 cup. Keeps for 1 week stored in the fridge. 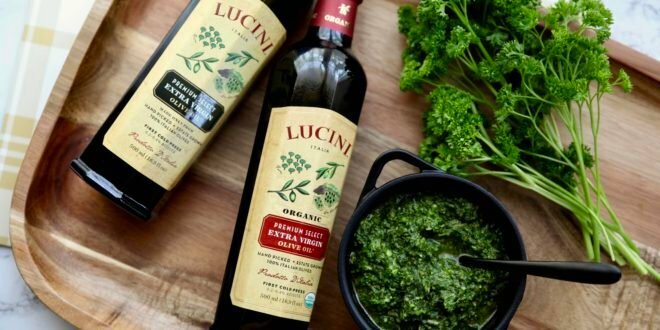 Visit the Lucini store locator to find their products in your local grocer, or shop their Whole30 Approved lineup, here. This post was sponsored by Lucini. Thank you for supporting our Whole30 Approved partners! Recipes and photos by Sarah Steffens has a B.A. in Business Administration, Public Relations from The Master’s College in Southern California. After years of experimenting with nutrition and recipes in her own kitchen, she now works as a Personal Chef in Los Angeles, cooking meals that support her client’s intention to physically and mentally thrive. She has catered several independent film sets, making it her goal to optimize the energy and well-being of each creative crew. She is the in-house recipe creative for the Whole30, and the creator of the Savor and Fancy blog. When Sarah is not cooking Whole30 and Autoimmune Protocol meals, she is likely exploring mid-century sites in L.A., taking photographs, listening to an audio book or hiking at Griffith Park.